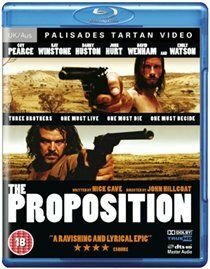 John Hillcoat directs this violent western set in the Australian outback, from an original screenplay by musician Nick Cave. Charlie Burns (Guy Pearce) is presented with an impossible choice by ruthless lawman Captain Stanley (Ray Winstone). To save his younger brother from the gallows, he must track down and kill his violent older brother Arthur (Danny Huston). In a harsh and oppressive environment, Charlie is forced to choose between loyalty and revenge, while Stanley tries to impose his own brutal codes of law and order, and shield his innocent young wife (Emily Watson) from the consequences.